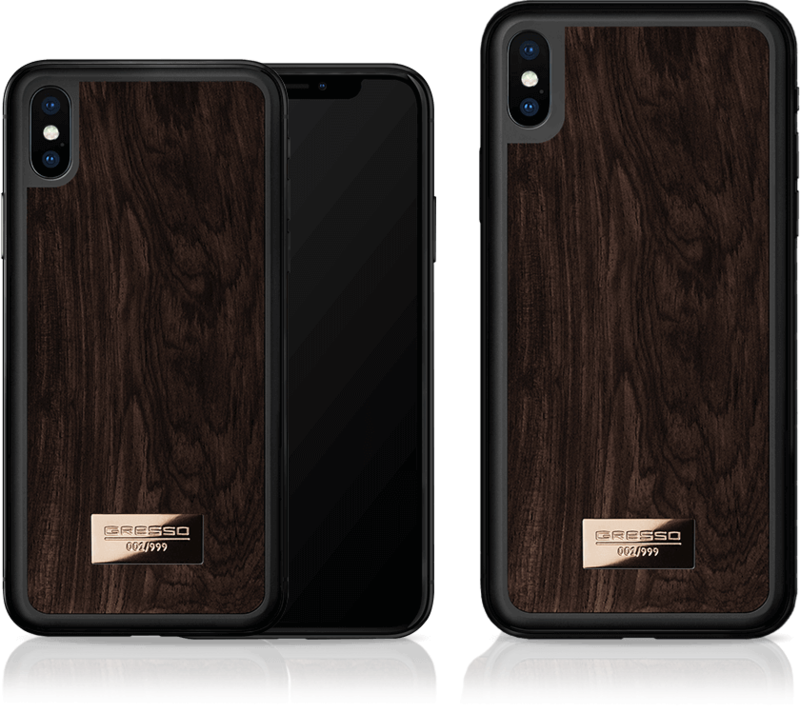 Gresso’s Blackwood Collection for iPhone Xs | Xs Max is created from 200-year-old African Blackwood -one of the rarest and most valuable species of wood in the world. Inspired by its incredible strength and durability as well as rich and luxurious color, our designers developed a sleek, modern collection that showcases the superior qualities of this exclusive material. African Blackwood has traditionally been used in the manufacturing of luxury goods, including jewelry and timepieces. Every piece in the Blackwood collection is unique – the back panel maintains the integrity of the wood’s natural grain and pattern, offering a design only nature could create. The collection is embellished with an 18k gold logo, radiating exquisite elegance and sophistication. The combination of deep ebony color and bright gold gives the Blackwood collection a stately, noble design. Crafted from exclusive materials, the Blackwood collection is reinforced with a titanium frame surrounding the wood back panel. Titanium is widely used in aerospace engineering and has superior protective qualities, reinforcing the device with strength and durability. Using an innovative PVD-technology, a technique widely used in the manufacture of luxury timepieces and jewelry, the titanium frame is coated in a rich black color that accents the ebony streaks found in the blackwood. Embodying Gresso’s commitment to the luxury experience, the Blackwood collection strengthens the iPhone Xs | Xs Max with a solid titanium frame and enhances the phones design with ebony wood panels and gold accents without increasing the size of the device. Each iPhone in the Blackwood collection is unique and handcrafted. The individual serial number is engraved on a gold insert on the back panel. You can select a specific number from the 999 pieces when finalizing your purchase. The Gresso Blackwood iPhone Xs | Xs Max collection is packaged in a high-quality black leather box. The smartphone includes a certificate of authenticity, user manual and wall charger with regional plug heads. African black wood. Titanium. 18K gold. 256 Gb. The back panel is crafted of titanium and 200-year African black wood. Add personal engraving to the prodict body as numerals, initials, drawing and etc. Attention, please! For your own security and protection, manager will ask you to send a valid photo ID (preferably with the correct address printed on the ID), scan of your credit card or passport and a proof of shipping address to confirm transaction even if your payment is successful. After receiving the necessary information, we will confirm the transaction and fulfill your order. Для оплаты покупки Вы будете перенаправлены на платежный шлюз ОАО "Сбербанк России" для ввода реквизитов Вашей карты. Thank you for your interest. Please submit the following information, and a Gresso Sales Specialist will contact you within 1 business day to finalize your order.